A warm and dramatic fireplace creates a comfortable atmosphere where you and your family members can spend quality time relaxing together. If you want to transform the appearance of your current fireplace to one that is striking and beautiful, Republic West Remodeling can help you determine the best fireplace remodeling plans to fit your unique style. 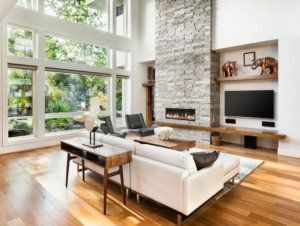 Some homeowners may not know how easily and quickly a fireplace remodeling job can be done without completely disrupting their living room space. 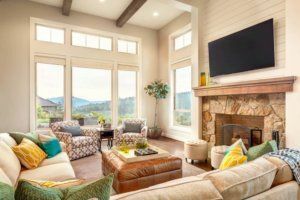 There are numerous options for fireplace remodeling, from removing existing brick and rebuilding, to using fireplace paint to lighten up and update the space. For example, refacing an old brick surround with the latest in tile or stone can be an incredibly simple way to alter the look of your fireplace. In many cases, a new surround can be installed right over the brick. When choosing a new surround, it is essential to keep your style preferences top of mind. For a formal room, for instance, consider using marble or granite tiles. Or, for a more modern look, select large, smooth tiles, or even trendy, small glass tiles. Selecting a new mantle that provides style and space to showcase art or photos can transform your fireplace from a simple room feature to a beautiful center piece. Schedule Your Free Fireplace Remodeling Consultation Today! Whichever direction you take, a high-quality, luxury fireplace remodel can give you a transformed space with a stunning fireplace as the centerpiece. If you are looking for a remodeling company that can help breathe new life into your home, trust our team at Republic West Remodeling. Contact us today for the highest quality luxury fire place remodeling. Call (480) 428-2695 for your free consultation or visit us online.